Prior to the official christening ceremony of MSC Meraviglia we were invited by MSC Cruises to enjoy two days onboard their new flagship. We were able to discover what sets MSC Cruises’ ship for all seasons apart from the others and makes it the eighth wonder of the world. When MSC Meraviglia was christened on June 3rd she instantly became one of the biggest and hottest cruise ships in the world. 19 decks high and with a maximum capacity of 5,700 guests, Meraviglia offers over 2,200 cabins in 10 different types ranging from interior to ultra-deluxe suites. 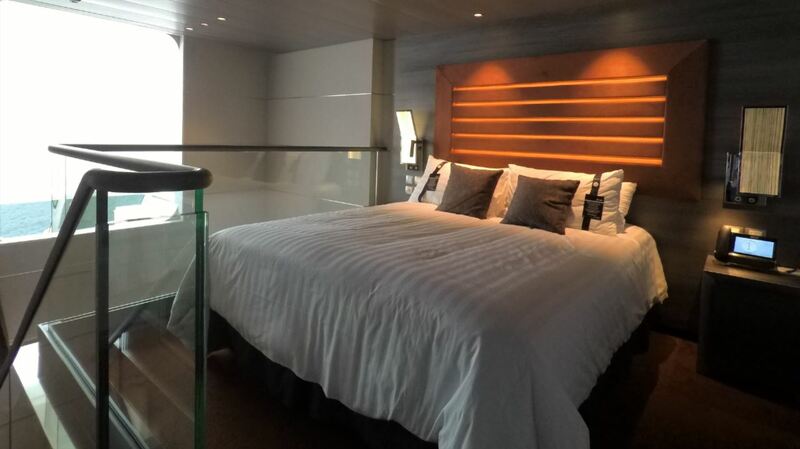 During our time on board we stayed in cabin 14121, which is a Balcony Stateroom which offers the Wellness Experience. 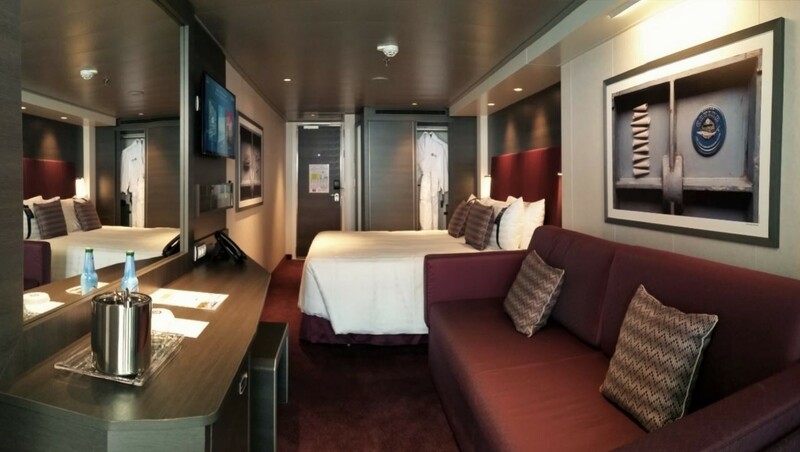 Upon entering our stateroom we were greated by a soothing burgundy-red colourscheme combined with a darkbrown deskspace/vanity area and wardrobe and that unmistakable new car, or in this case new cruise ship, smell. As you may remember from our article on the different types of experiences you can book to personalize your cruise experience, staterooms vary in colourscheme according to the booked experience. Our room came with all the amenities you would expect in a modern (hotel)room. Amenities include a mini-bar, hairdryer, flatscreen TV, telephone, climate control and delivery of ice upon request.. Thinking of today’s modern travellers, MSC has even included a USB port next to the power outlets, so combined with the 2 European and 2 US-style power outlets you can charge 5 devices at the same time. Nevertheless it would be great if MSC added a USB ports in the bedside reading lights on the next ships. Our room also featured a large sofa, which we thought would transform into a sofa bed. However a little research on our part revealed the sofa actually turns out to be a bunk bed. 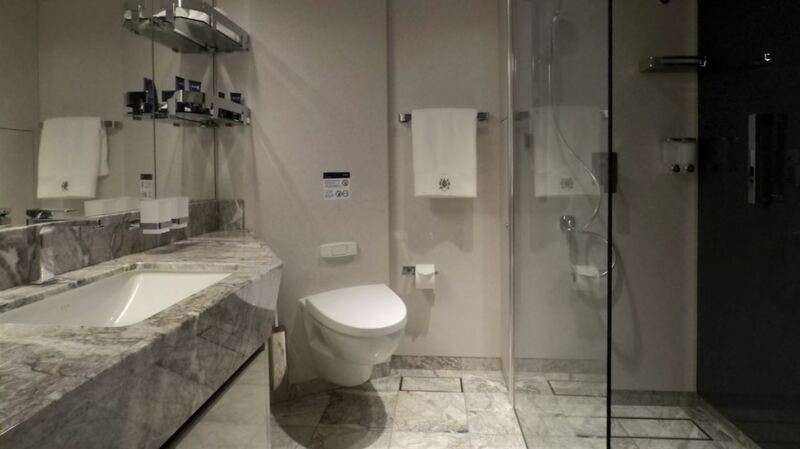 The clean white bathroom offered adequate storage space and complimentary bath products (shower gel, shampoo and soap but no washcloths or body lotion). While we do love the new design of the cabins we did notice they offer a minimum of storage space. For us travelling as a couple this would not really be a problem, but we can imagine for a family of four this might be an issue. 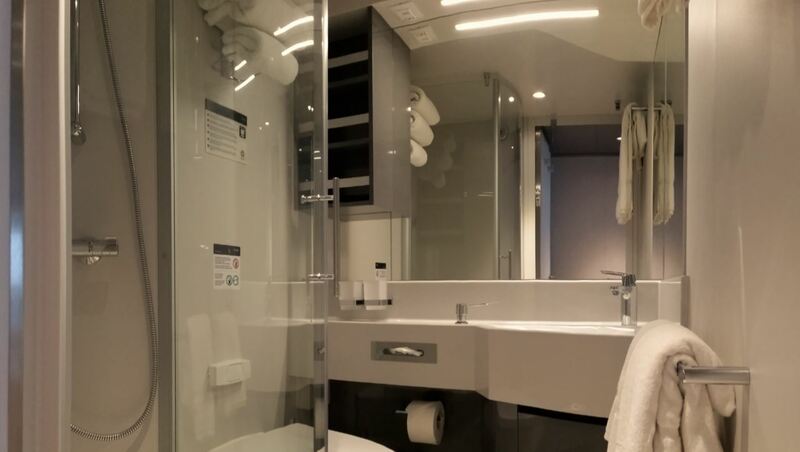 The trend for multi-generational holidays has led MSC Cruises to come up with a clever and unique Modular Cabins system. 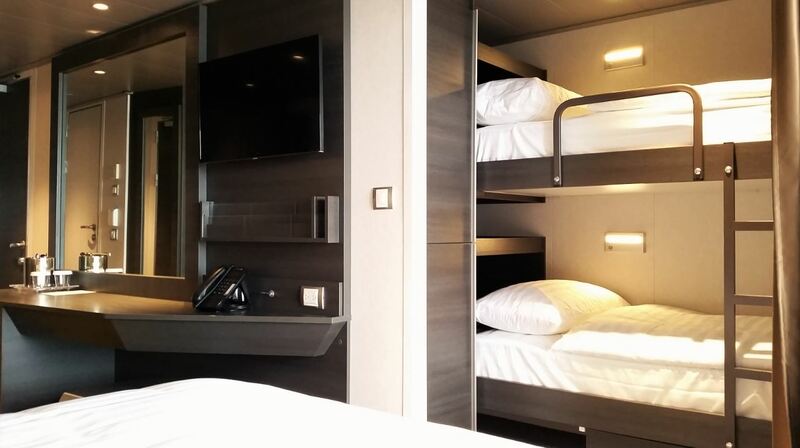 Within the modular cabins system up to three, otherwise separately sold, cabins can be combined together to accommodate up to 10 guests. 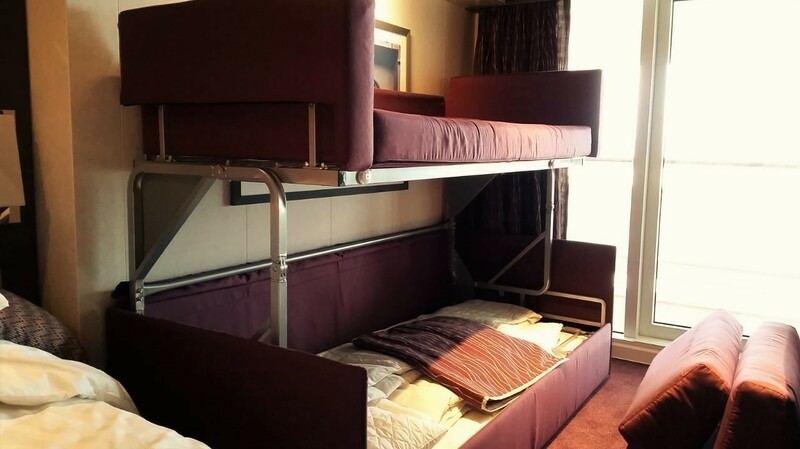 A Family Stateroom can for example be made of two connecting staterooms, let’s say 1 balcony stateroom & 1 interior room. This combination would mean the family has 1 balcony and 2 bathrooms. 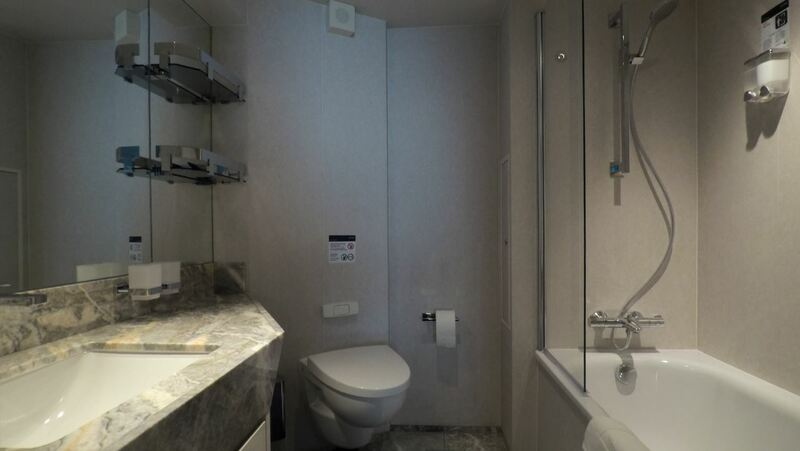 A Super Family Stateroom would consist of 2 connecting balcony staterooms each with their own bathroom (one equipped with a shower, one equipped with a bathtub). 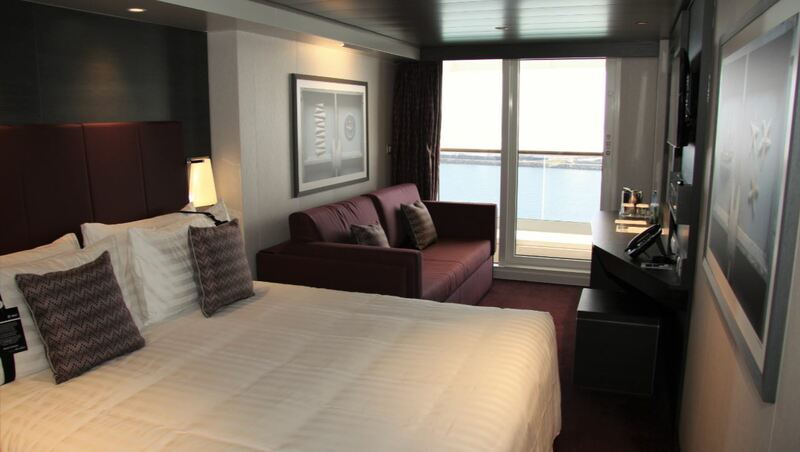 And finally the Super Family Plus Staterooms which comprises three connecting staterooms, 2 balcony staterooms and 1 interior room (2 balconies and 3 bathrooms). 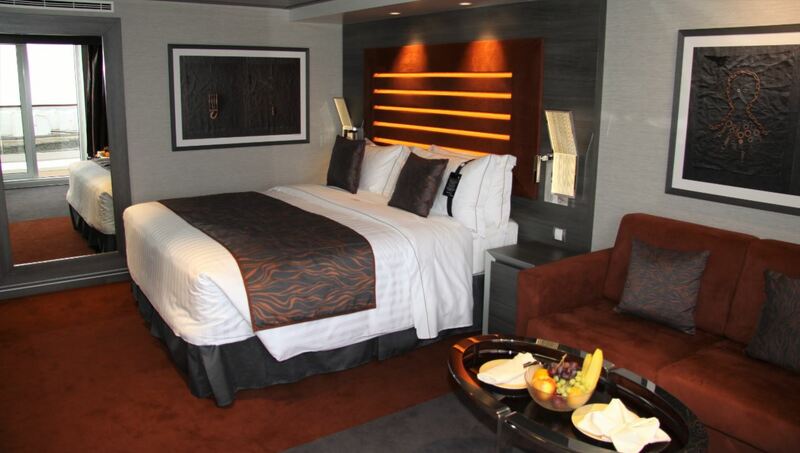 This stateroom type accomodates up to 10 guests. 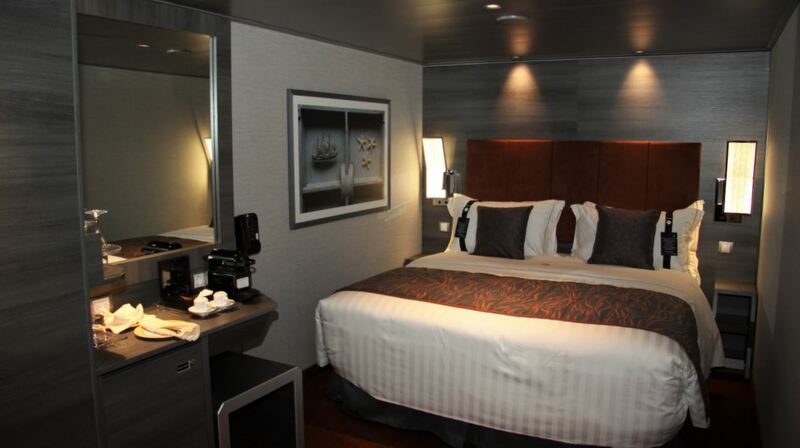 Also new for MSC Cruises and Meraviglia are the Duplex Suites. 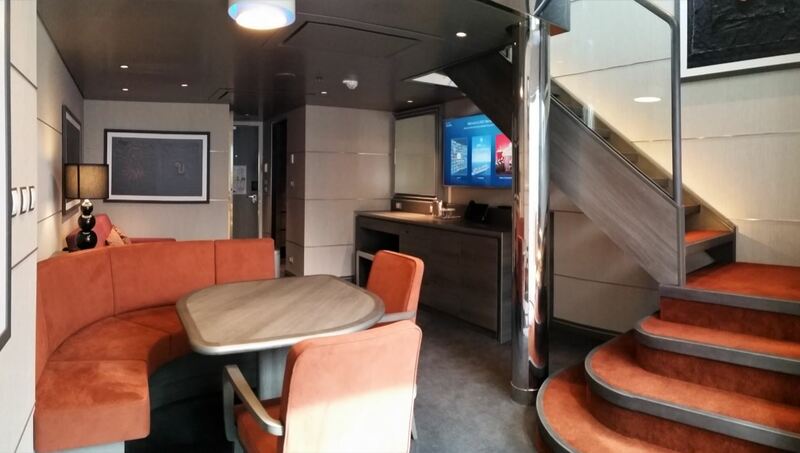 These two-deck-high staterooms have an open living/dining room area with a sofa that converts to double bed on the main level. On the second level is the master bedroom with queen bed. The Duplex Suites have two walk-in wardrobes and two bathrooms (one with shower on the ground floor and one with a bathtub on the upper floor). 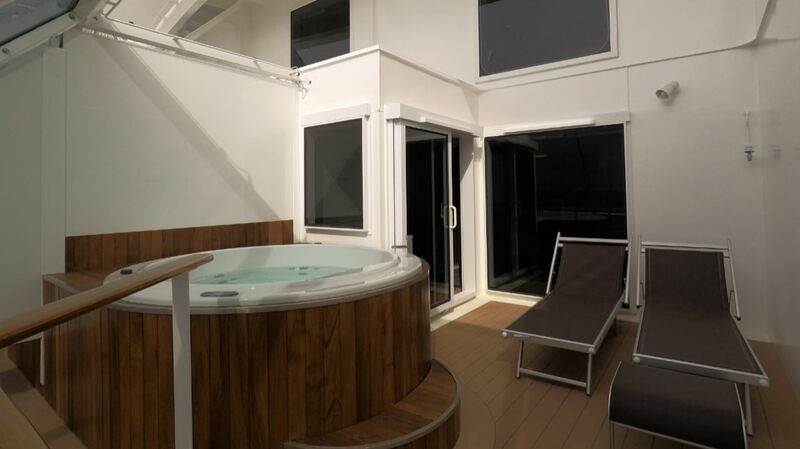 The one thing that makes these Duplex Suites really unique is the outdoor whirlpool. 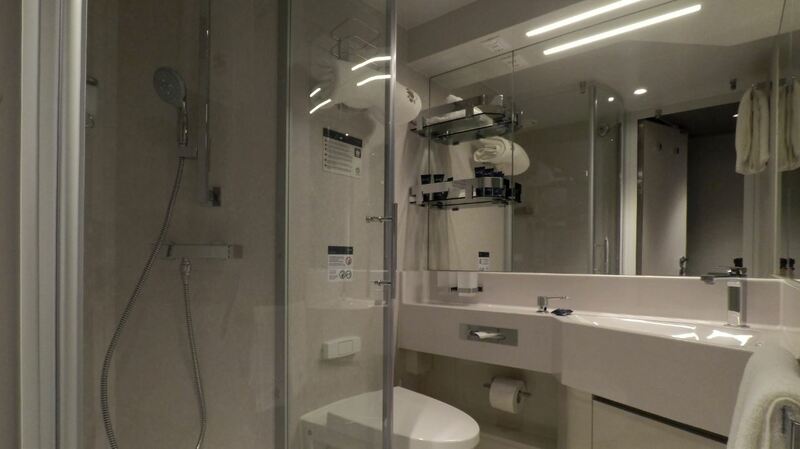 If you are interested in other staterooms onboard MSC Cruises’ ships visit our review of the cabins onboard MSC Splendida. The luxury MSC Yacht Club, an exclusive area for guests demanding the highest standards of luxury, spans three decks and offers 78 suites, 15 inside cabins and two apartments. 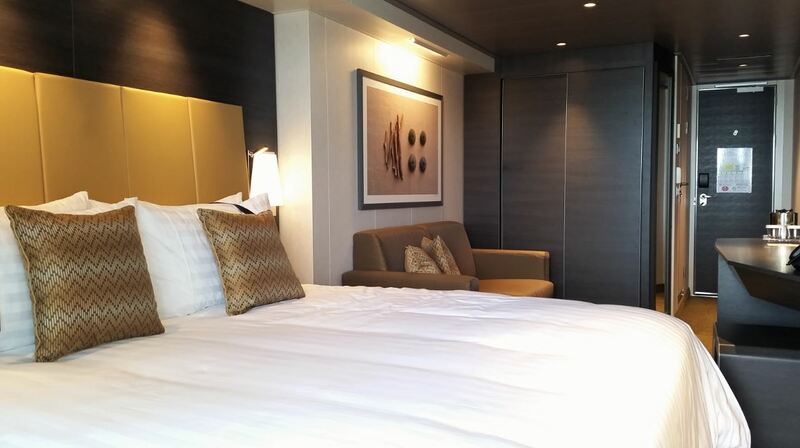 The Yacht Club Interior Suite is about the same size as regular inside cabins but benefits from the upgraded luxury and amenities the Yacht Club offers. These include priority check-in and check-out, concierge and butler service, unlimited drinks in all MSC Yacht Club venues (including the mini-bar and complimentary beverage selection in all onboard bars and restaurants), an espresso machine in the room, use of the private MSC Yacht Club restaurants and the private sundeck. The Deluxe Suites in the Yacht Club measure approximately 301 sq. ft., plus a balcony and benefit from all the above mentioned Yacht Club benefits. Having explored the rooms onboard MSC Meraviglia we can honestly say that, with a choice of 10 different types of staterooms, combined with different types of experiences to choose from, MSC has designed a cruise ship not only for all seasons but also for all ages and all tastes. Looks snazzy!! Im cruising on her in December but just in an inside cabin. Same here, 8th Dec from Barcelona. Can’t wait. Fab post. Not seen much about the rooms so great to have so much detail. Was that the double sofa bed? I have booked Seaview with a double sofa bed as didn’t want kids on bunks? Not sure how I feel about that bunk bed!! Creepy. Looks like it might fall on you and thats the end of you… haha.